Same disclaimer as on the first fish I.D. album (see http://optimimagery.com/gallery/7934566_squYR/1/515598376_RsLwG). Second, I'd like to thank Brad Derksen for suggesting these little tutorials. You can see his excellent and entertaining website at http://scubablues.blogspot.com/ (if you click for that and see that I have contributed the most recent entry, scroll down until you come to some of Brad's stuff). If you see anything herein which you like, or anything which you disagree with, please leave your very own comments on the shots. You can also contact me at optimimagery@gmail.com. If you are like me, it is quite common for you to surface from a dive to hear your dive buddy ask “What kind of fish was THAT?” Also, if you are like me, it is not uncommon that you may have no idea WHAT kind of fish it was. Well, if you keep the following in mind, it may help: 1. There are more species of Gobies than there are of any other family. 2. Gobies are generally in holes, and often are not seen. 3. 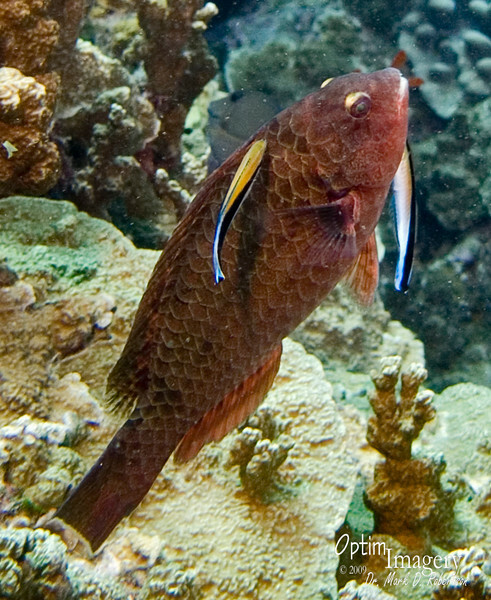 The family in SECOND place for number of species is WRASSES. 4. Wrasses tend to be swimming in the water column, not hiding in holes or resting on bottom, so they are out where they are more likely to be seen. You will be even MORE likely to be correct if your mystery fish has some of the characteristics mentioned in this album (in the captions under the individual photos). First, there are the little cleaner wrasses, which you see bobbing up and down in a dance to attract other fish to clean. Here you see two cleaner wrasses catching their dinner to the delight of their host, who is enjoying such efficient removal of pesky parasites which provide the diet for the cleaners. A little aside for photographers wanting to get nice shots of different kinds of fishes: Park yourself where you see cleaner wrasses dancing. Very often you will see numerous species come by for a good cleaning over a short period of time. Often, otherwise shy fish will remain at the cleaning station and allow you to get some decent photos.